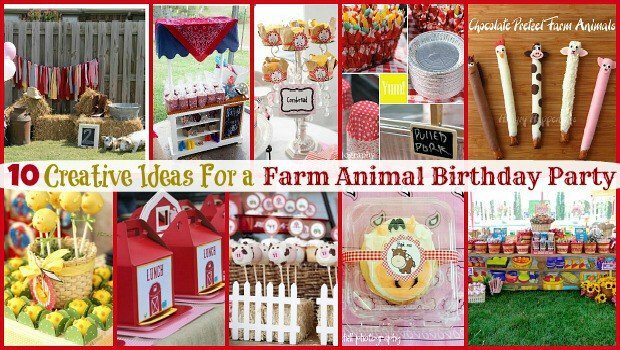 A few months ago, I put together a Farm Birthday Party post that has been really popular here on Moms & Munchkins so I’ve decided to follow it up with 10 Creative Ideas for a Farm Animal Birthday Party featuring some fabulous ideas from other bloggers and party designers. Get your computer mouse ready because I know there are some blogs here that you’re going to want to bookmark! I love a fun party photo booth! It’s a fun activity for all ages plus it makes such a sweet keepsake after the party. Check out this creative outdoor photo booth by Lovely Expressions. There are so many extra decorations there for the guests to have fun with. 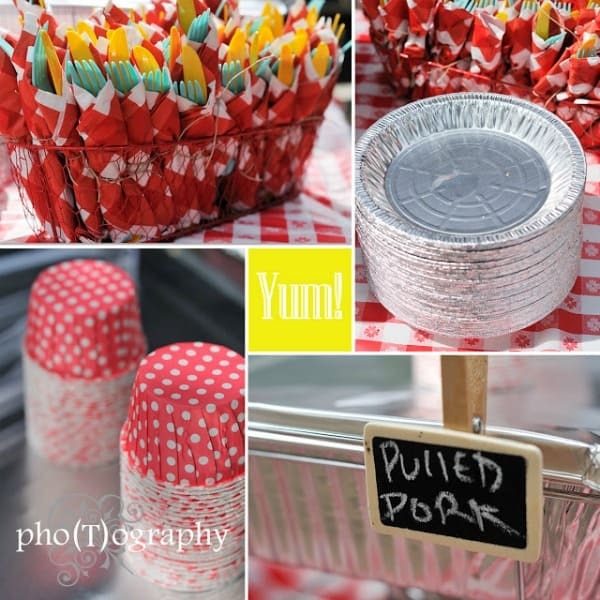 Alyssa at Just a Little Sparkle had a great idea for dinner plates for her daughter’s farm-themed party – pie tins! Such a clever way to serve the food in a rustic cookout theme. Top those pie tins with pulled pork on a bun, baked beans and coleslaw and you’ll have a delicious farm-themed meal that all of the guests will enjoy. 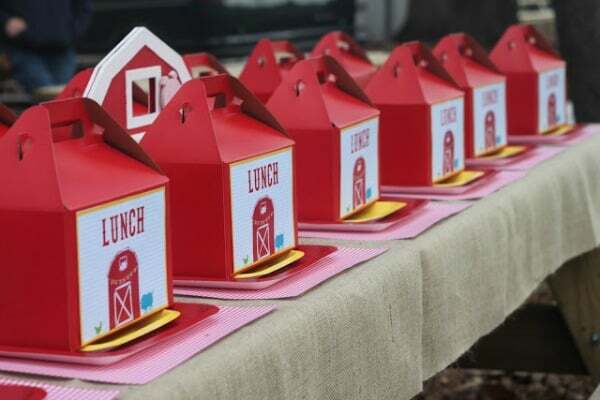 For pre-packaged meals for your little guests, this lunch box idea from The Homespun Hostess is perfect! How great would this be for kids that have special dietary restrictions?! Simply put a name tag on each child’s lunch box and no one feels left out if they are eating a special meal that is different than everyone else. Also, each child can take home their little lunch box after the party. Now onto one of my dad’s favorite snacks – cornbread! 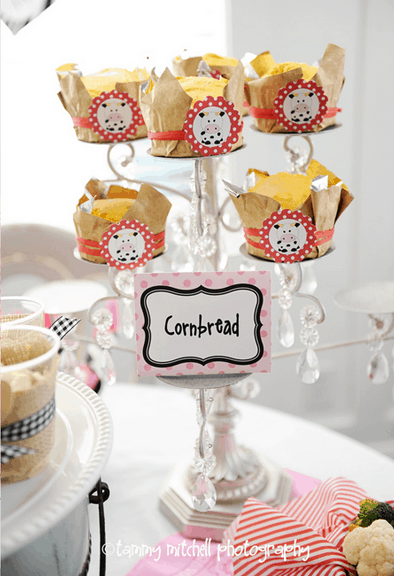 I love the way that Tammy Mitchell Designs dressed these cornbread snacks up with wrappers and farm-themed tags. What child doesn’t love cake pops, right?! 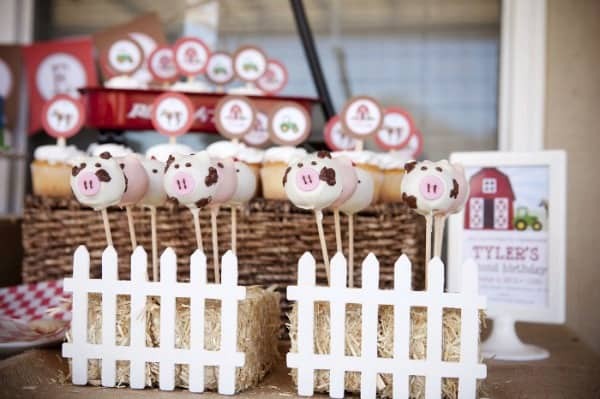 I love this idea from My Paper Pinwheel to place the cake pops in little hay bales surrounded by a white picket fence. Adorable! A delicious snack and a creative piece of party decor. 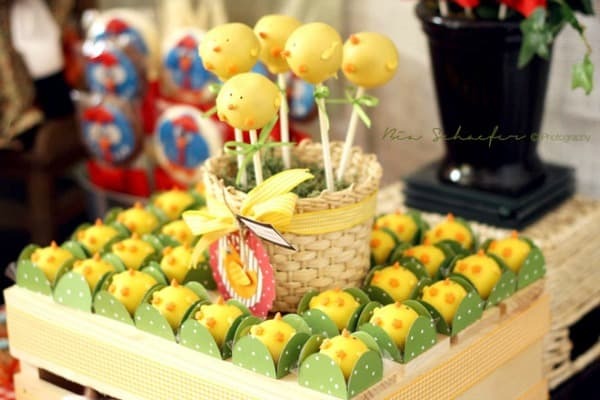 Speaking of cake pops, check out these adorable chicks from Love the Day. I love the way they are individually packaged for little fingers. You have to head over to read the full post to check out all of the cute decor ideas. Love the mini wagon! My favorite site to go for themed food ideas is Hungry Happenings. Her creativity amazes me! 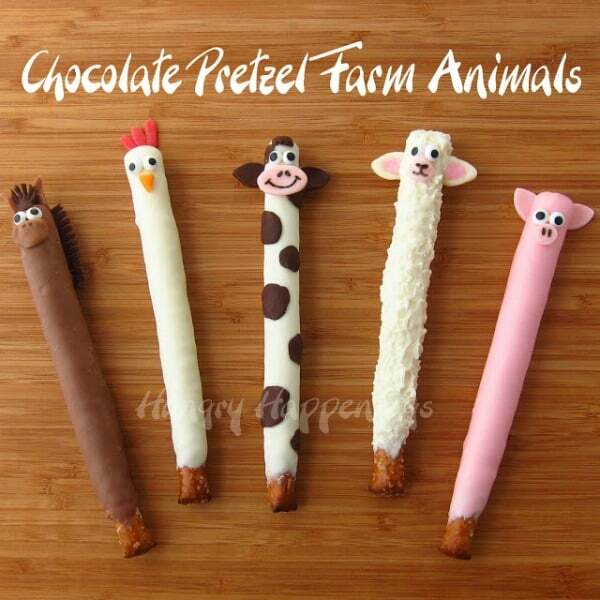 Check out these sweet chocolate pretzel farm animals. She even has an easy to follow tutorial so that you can make your own. 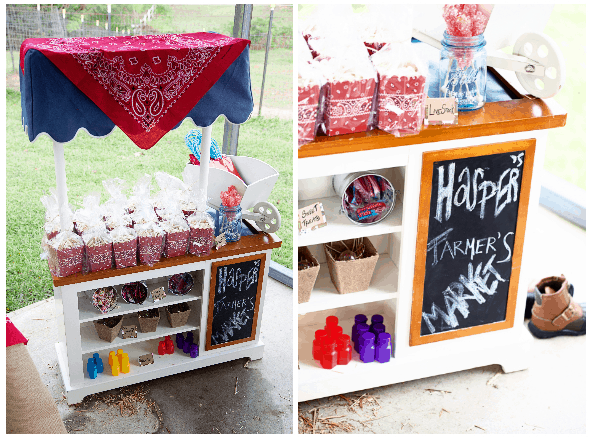 A farmer’s market for a farm-themed birthday – fabulous idea! Check out this cute setup from Fried Pink Tomato complete with treats & favors. Wow! 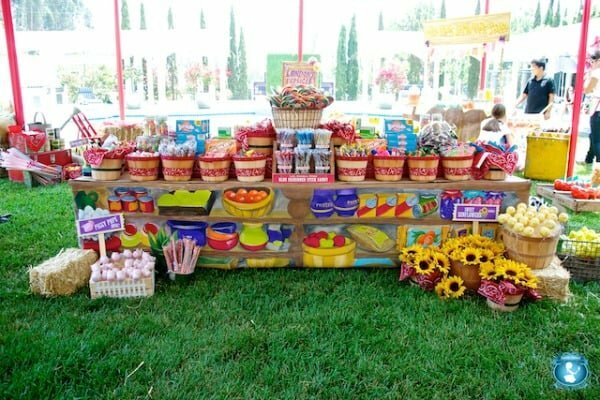 Check out this ultimate farmer’s market favor table from Sweets Indeed. Amazing! You have to head over to the blog to get a closer look at all of the fabulous “purchases” you can make in this farmer’s market. Loads of inspiration in that post! This favor idea from Tammy Mitchell Designs is so clever! Can you read the tags? Moochas Gracias and Thank Moo. So clever and adorable! I love this favor idea and I wish I could try one of those cookies because they look delicious. 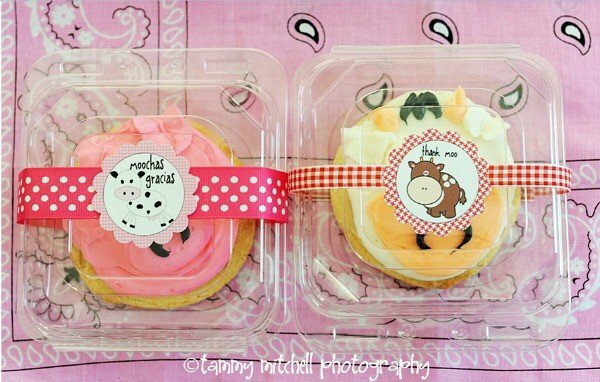 So there you have it – 10 Creative Ideas For A Farm Animal Birthday Party. How many of these ideas will you be trying for your next party? For more party planning inspiration including creative themes, activities ideas, free planning checklists and more, visit our Birthday Party page. We’re always adding creative new party ideas! Never miss an update by following us on Facebook, Twitter, Pinterest and Bloglovin’. What a wonderful compliment, Cheryl. I’m so happy to hear you like Hungry Happenings so much. That makes my day! I really appreciate you including my Farm Animal Pretzel Pops in your round-up. You found some really great projects for a farm animal party. I love to see so much creativity.